Imagine streets with no dustbins. Imagine a place where everybody litters wherever they want. 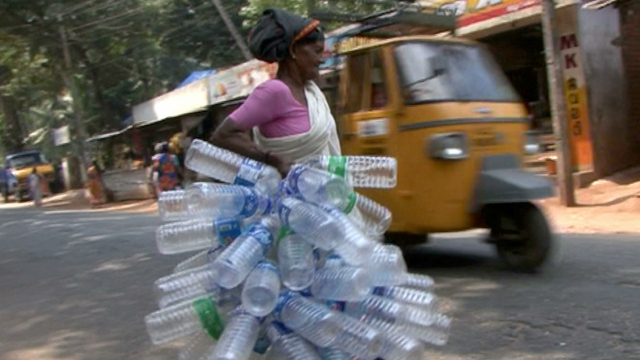 Against this chaotic backdrop, India has the highest recycling levels in the world. India's 'informal recycling' industry has become an important business sector in its own right. Ramshackle sacks of general scrap are piled up in every corner; while a group of women busily sort plastic by type and color. Most of their income is earned laboriously salvaging any recyclables they can sell on. Despite the benefits of recycling, prejudices against 'informal-pickers' are yet to be overcome. But very few places in the world have organized as sophisticated and successful a network of 'recycling cooperatives'. They keep the place clean and provide employment for the poorest.